Sriperumbudur is a small village around fifty kilometers from chennai. Around thousand years ago, there lived a couple named Asuri Kesavacharya and his wife Kanthimathi. Asuri Kesavacharya was very religious and used to do lot of poojas to God Sriman Naryana. This couple were leading a very happy and peaceful life. But they did not have a child for long time. During that time, there was a great acharya called Thirukatchi Nambi. He used to visit the house of Asuri Kesavacharya very often. Once Kesavacharya told Thirukatchi Nambi about his desire to have a son and asked him to request Perumal of Kancheepuram to bless with a son. So Thirukatchi Nambi prayed to Perumal and Perumal told that if Asuri kesavacharya performs yagna to Lord Partahsarathy of Tiruvallikeni, he will have a son. So the couple Asuri Kesavacharya and Kanthimathi went to Tiruvallikeni and performed yagna with full sincerity and devotion. Lord Parthasarathy was very much pleased and in the dream He told him that He was much pleased with the sincerity and told them to go back to their place and their desire will be fulfilled. After about an year or so, on 4th April 1017 A.D., on a Thursday, Kanthimathi gave birth to a child. The child had a lot of auspicious marks on his body. The boy later came to be called Ramanuja. Khantimati had a brother called Peria Thirumalai Nambi. She also had a sisiter called Mahadevi. When ramanuja was born, Mahadevi also got a child, called Govinda. No sooner Periya Thirumalai Nambi heard this good news about the birth of sons to his sisters he came to Sriperumbudur. He was very happy to see both the children. He saw Kanthimathi's son with divine traits similar to what Sri Lakshmana did posses. Just as Lakshmana dedicated his life to Rama, Periyathirumalai Nambi named the child of Kanthimathi as Ramanuja which means who does his duty with devotion and dedication to Lord Rama. It is also believed that Ramanuja is none other than Sri Lakshmana, who is the incarnataion of Adi Sesha. The two children grew with lot of care from their parents and their uncle. They underwent all rituals(religious procedures) such as boring ear lobes, function of first tonsure, initiation in studies, wearing sacred thread, at the appropriate ages. Ramanuja was a very intelligent boy. If he listens to a lesson taught by his teacher once, he will grasp it and repeat it. He always used to move with good friends. Also from his childhood days he used to become very close with the holy men and he always liked them very much and have them in his heart. At that time, in Kancheepuram, a town near Sriperumbudur, there lived a teacher. His name was Yadavaprakasa. Students from nearby and also far off places came to his Gurukulam (School). Ramanuja also joined his school and became his disciple(student). Yadavprakasa was very happy to have Ramanuja as his student. 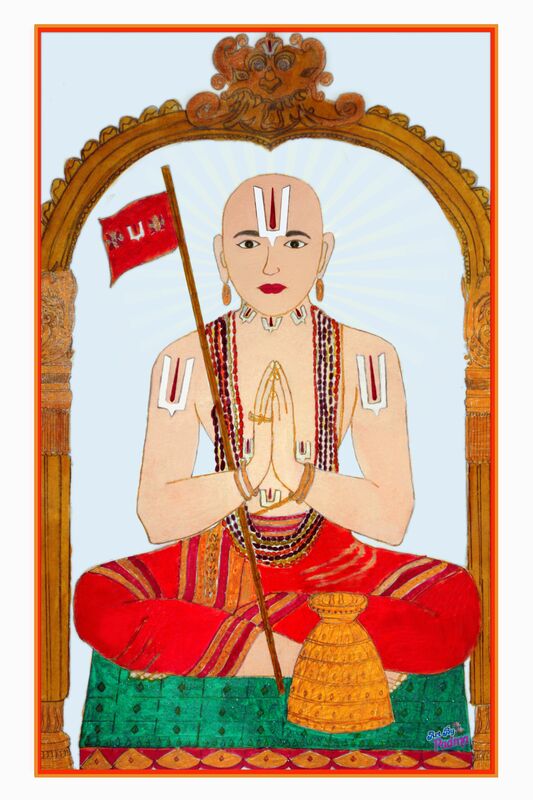 Ramanuja grew to become one of the best students of Yadavprakasa. But as times passed by, Ramanuja was not able to accept some of the explanations and meanings given by his guru(teacher). There were lots of difference in opinion between him and the guru. Over a period of time this difference became very big. At the same time Ramanuja's popularity also increased. 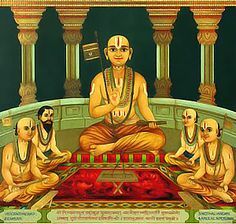 Ramanuja's cousin Govinda also joined the gurukulam at this time and started studying along with him. Yadavaprakasa did not like Ramanuja coming up and wanted to kill him. So he made a plan along with his other disciples to take a pilgrimage(holy tour) and on the way kill Ramanuja and go to ganga and get rid of the sin. On an auspicious day all the students with Yadavaprakasa started the holy tour. After a few days, when they reached the vidhya mountains in central India, Yadavaprakasa decided that it was the right time to kill Ramanuja and started acting on his plan. Somehow Ramanuja's cousin came to know about this plan and told Ramanuja to escape. Ramanuja immediately took the advice of his cousin and ran inside the forest. Yadavaprakasa and the other disciples started searching for Ramanuja and Govinda also acted as if he did not know anything about this. After some time they concluded some animal would have killed Ramanuja and continued their pilgrimage. After Ramanuja escaped into the forest, he ran for a long distance and sat below a tre to take some rest. He was so tired that he fell asleep immediately. After some time when he woke up he found the sun setting in the west. He thanked Lord Varadarja Perumal of kancheepuram for saving his life. At the same time, he saw a fowler couple(bird hunters couple) coming near him. They asked Ramanuja if he had lost his way. Ramanuja said yes and told that he wanted to go to Kancheepuram. The fowler couple told that they were going to Rameswaram via Kancheepuram and they will take Ramanuja there. The couple also thanked God for giving a good companion in Ramanuja for them. Though Ramanuja was a little afraid of seeing them, their affection towards him made Ramanuja think good about the couple. Then Ramanuja agreed to go along with them to kancheepuram. Next day morning, the wife of fowler couple wanted to have water. So Ramnuja went to a nearby well and brought her some water. Even after bringing water for nearly three or four times she was still wanting to have more water. Ramanuja was surprised but without any hesitation he again went to the well and brought some more water. As soon as he came up, he was surprised to see the couple were missing. He looked around and started seeing the big tower of the temple and lot of people walking by. When he asked one of the passerby what was the place he was told that it was Kancheepuram. Immediately he realized the drama played by SrimaN Narayana and Lakshmi to bring him safely to Kancheepuram and thanked them for their blessings. At home ramanuja's mother was very sad as she was thinking that she could not see him for the next few months until he returns from his tour. All of a sudden when Ramanuja went and fell on her feet she could not believe it at all. Ramanuja then told the entire story of what happened to him. She enquired about Govinda and both prayed to Lord Varadaraja Perumal for the safe return of Govinda. After a few months Yadavaprakasa returned to kancheepuram He was shocked to see Ramanuja. But he did not show any thing to him and enquired about Govinda and what happened to him. Yadavaprakasa told that he had stayed in Kalahasti. A few days later, Yamunacarya(Alavandar), a great saint from SriRangam came to Kancheepuram. He saw Ramanuja passing by along with Yadavaprakasa. 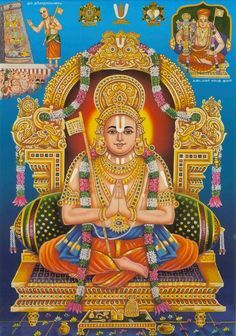 When Alavandar saw Ramanuja he was attracted by his personality and prayed to Lord Ranganatha of SriRangam to make Ramanuja serve Ranganatha Himself. Ramanuja's glory started growing day by day in all directions. Yadavaprakasa continued his classes but became afraid of Ramanuja. In the class lot of meanings thought by Yadavaprakasa about our Vedas and scriptures were not acceptable to Ramanuja. When Ramanuja expressed his views, Yadavaprakasa told that if Ramanuja could listen to his teachings he could stay otherwise he can go away. So Ramanuja decided to go away and started learning by reading lot of holy books. One day Thirukatchinambi came to Ramanuja's house. On seeing him Ramanuja fell at his feet and wanted to be his disciple. They both were talking for a long time and Thirukatchinambi appreciated the devotion of Ramanuja towards Sriman Narayana. Instead of accepting him as a disciple, Thirukatchinambi told Ramanuja to bring holy water every day for Lord Varadaraja Perumal from the nearby temple well. Ramanuja happily accepted this divine service to Lord and continued to do this until he left for SriRangam. In SriRangam, Alavandar fell ill. He came to know from two bramanas who had come from Kancheepuram, that Ramanuja had parted company with Yadavaprakasa and was doing noble service to Lord Vardaraja Perumal in Kancheepuram. Alavandar felt very happy and asked Periyanambi (Mahapurna) to go to Kancheepuram and bring Ramanuja and join him to their fold. Perianambi went to Kancheepuram and saw Ramanuja. He was attracted by the divine features of Ramanuja and stated singing some stotras sung by Alavandar. Ramanuja was attracted by these stotras and learnt that these were sung by Alavandar. Perinambi expressed the desire of Alavandar to meet ramanuja and Ramanuja immediately accepted to go to SriRangam and left the same day. 2. I shall write 'THE SHRI BASHYA' which will give the entire world the knowledge of reality. 3. I shall name a deserving child after Parasara Batta. As soon as Ramanuja told these three, Alavandars fingers straightened. Soon all disciples of Alavandar requested Ramanuja to stay with them. But he did not stay and went back to Kanchepuram. Ramanuja was married to Thanjammal. After the death of Ramanuja's mother, Thanjammal was taking care of the household and was serving Ramanuja by observing all rituals. 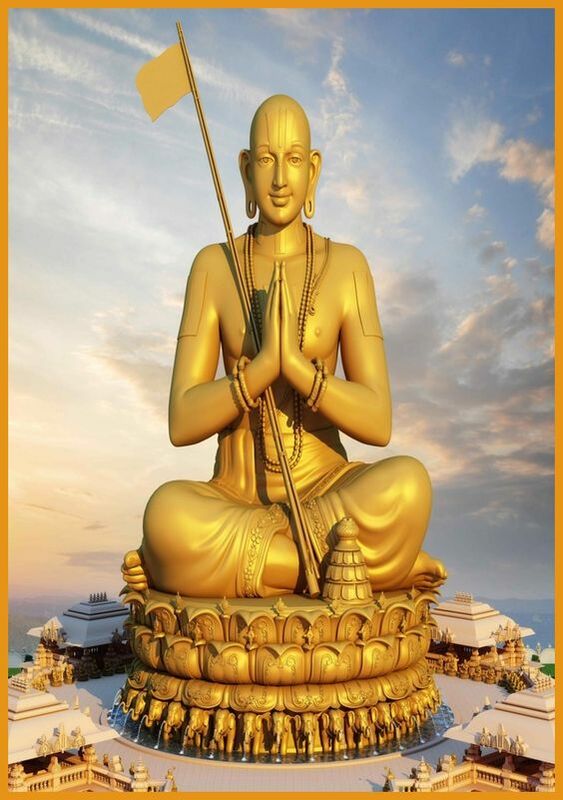 Ramanuja was continuously getting the advice and teachings from Thirukatchnambi. But he wanted to have a guru and continue his studies. He was very much concerened as to how he will get a guru and with whom he can continue his studies. 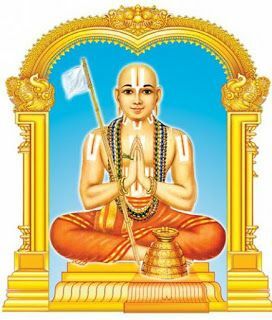 Ramanuja expressed this to Thirukatchnambi and in turn he prayed to Lord to lead them as to how Ramanuja can get a guru. At that time, Lord Varadaraja Perumal told Kanchipurna that Ramanuja should go and join Mahatma Mahapurna as a disciple. As soon as this divine message was conveyed to Ramanuja he felt excited and immediately left for SriRangam. At the same time, after Alavandar's passing away, all his disciples requested Perianambi to go to Kancheepuram and bring Ramanuja to be with them. So Perianambi also left for Kancheepuram. Both he and Ramanuja met on the way at a place called Madurantakam. As soon as Ramanuja saw Perianambi he feel at his feet and wanted him to accept Ramanuja as his discple. Perianambi was very happy and held Ramanuja by his arms and gave the insignia of Vishnu the Disc and Conch. Both of them together went to Kancheepuram to perform the sacred ceremony before Lord Varadraja and Ramanuja became the disciple of Perianambi. Soon after Ramanuja became the disciple of Perianambi, he started studying the Sacred 4000 Divya Prabandam from him. Ramanuja had housed his guru in his house and was extremely happy. One day when Ramanuja returned home from outside, he found that his guru and his wife who were staying with him had left. He asked his wife about this. She told that she devolped some quarrel with the guru's wife near the well and they had left. Ramanuja got shocked and rushed to the temple. On the way he saw a bramana who looked very hungry and tired. Ramanuja asked him why he is so. The bramana told he has not taken food for a few days and when he went to Ramanuja's house, his wife told the bramana to get away. The bramana expressed surprise on her behaviour. Ramanuja felt very bad and told the bramana that he will give a letter and if he gives it to his wife she will give food. Ramanuja's wife gave the bramana the food and she left the house to her father's house. Ramanuaja left the house and went and fell at the feet of Lord Varadraja and took up Sanyasin. He procured Orchure cloth and a staff touched by the feet of Lord. At this time, Thirukatchnambi, under the command of Lord addressed Ramanuja as "ETHIRAJA" meaning King of ascetics. 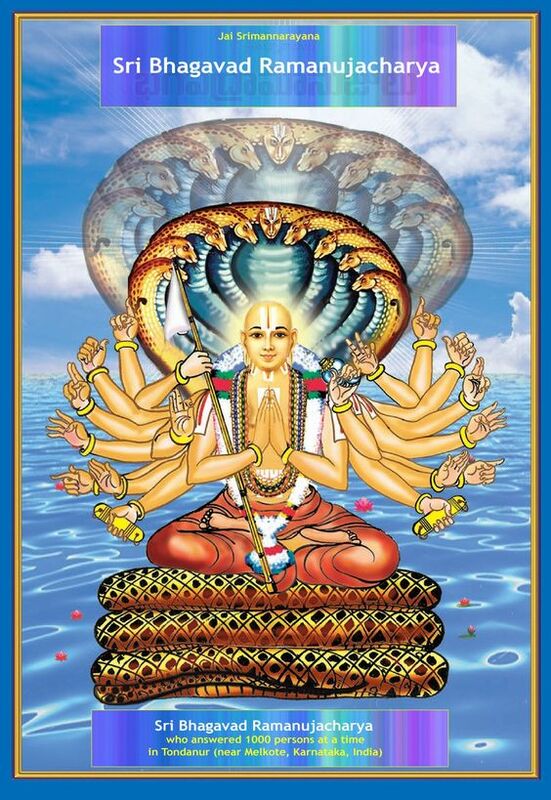 Ramanuja immediately accepted the triple staff (Tridanda). From then on people from all directions poured to see Ramanuja and listen to his teachings and recive his blessings. The inmates of the monostery in Kancheepuram made Ramanuja their head. Dasarathi(Mudaliandan) his nephew became the first disciple of ramanuja and Kuresar(Kurathalvan) became the second disciple. Then lot of Sriman Narayana's devotees followed them to become disciples. Kuratalvan had an extraordinary memory power. If he read or listened to something once he will never forget even a single word. One day Yadavaprkasa's mother saw Ramanuja in the temple. And was captivated by his divine features. She wanted his son to become Ramanuja's disciple and rushed home and told Yadavaprakasa to go and join as Ramanuja's student. Yadavprakasa did not like this but at the insistence of his mother he went to meet Ramanuja. Ramanuja offered him a respectful seat and both were talking for a long time. After talking, Yadavaprakasa understood the greatness of Ramanuja and fell at his feet and became his disciple. Ramanuja blessed him and gave him the name Govinda Jeer. Yadavaprakasa than became a true devoted vaishnavite. Ramanuja told Govinda Jeer to write a book on the duties of a Vaishnavite. He wrote the book called " YATIDHARAMSAMULLAYA"
In SriRangam, after the passing away of Yamunacharya, the monostery had a leader in Thiruvaranga, son of Alavandar. But the monostery was not having a divine touch. They prayed to Lord Ranganatha of SriRanagam who Himself ordered Mahapurna to go to Kancheepuram, sing songs in praise of Lord Varadraja Perumal and ask for a boon. Then ask for Ramanuja and he will come with you. Accordingly, Perianambi came to Kanchi Varadaraja Perumal temple, sang Divya Prabandam and got a boon and requested for Ramanuja. Perumal granted the boon. So Ramanuja left for SriRangam along with Mudalianadan and Kurathalvan and a host of disciples and devotees. While Kancheepuram was very sad to part Ramanuja, SriRangam was very happy to receive Ramanuja. Even Lord Ranganatha Himself invited Ramanuja into the temple by calling " come on my son, Udayavare". From then on Ramanuja came to called as Udayavar also. After reaching SriRangam, Ramanuja had sent word to his uncle sri Thirumalianambi and requested him to go to Kalhasti and bring his cousin Govinda. After that Govinda also became a disciple of Ramanuja and Govinda came to be called as "EMBAR". Ramanuja's quest for learning never ended. 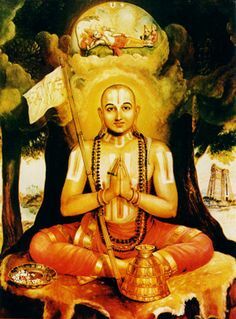 Perianambi told Ramanuja that in a nearby place called Thiurukottiyur, there lived a learned scholar who knows the meaning of the most sacred divine manthra and told Ramanuja to get it. 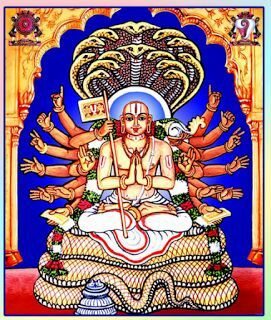 Ramanuja attempted a lot of times and atlast in the eighteenth attempt, Thirukottiyur Nambi agreed to part with the Mantra and its meaning. But before that he got a promise from Ramanauja. As per the promise, Ramanuja should not tell this to anyone as this mantra will take a person who listens to it directly to Vaikuntam and if it is told out to others Ramanuja will go to hell. Ramanuja with great excitement and anxiety got the mantra and started going back to SriRangam. While he was walking thinking of what he heard, all of a sudden he had a feeling and wanted this mantra to be known to one and all in the world so that everyone can reach Vaikundam. So Ramanuja went up to the nearby temple,raised his voice to the highest peak and called whomsoever is interested to learn the divine mantra. He then initiated those who are eligible and interested to learn this mantra. Thirukottiyur Nambi came to know of this and became very angry. He rushed to Ramanuja and enquired why he told this against the promise he had given. Ramanuja replied that by telling this Divine Manthra only he will go to hell but the entire humanity will reach Vaikuntam. This is what he needed and he did not mind going to hell alone. Listening to this Thirukottiyur nambi embaraced Ramanuja. 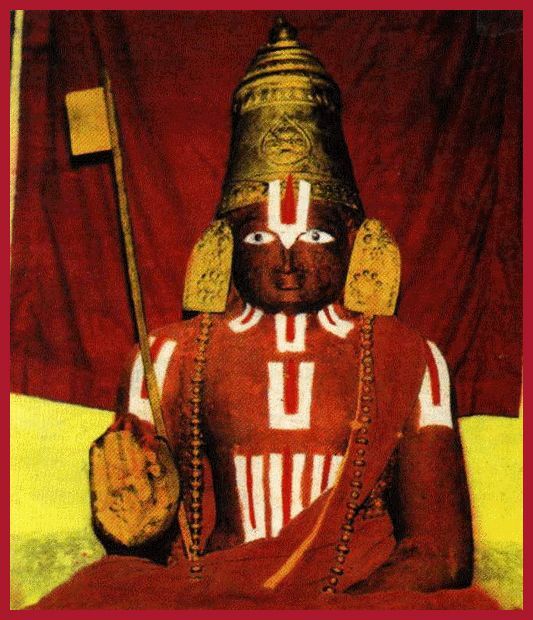 Thirukottiyur Nambi also made his son Sowmyanarayan as Ramanuja's disciple. After this incident, everybody started looking at Ramanuja as an incarnation of Lakshmana and he came to be called as " EMBERUMANAR" by Thirukottiyurnambi. Ramanuja continued learning Divya Prabandam and started giving his meanings. This attracted more disciples for him. Alavandar one of the most learned gurus with lot of divine powers had five intimate disciples. They were, Thirukathchi Nambi, Periya Nambi, Thirukottiyur Nambi, Thirumalainambi and Thiruvaranga perumal. 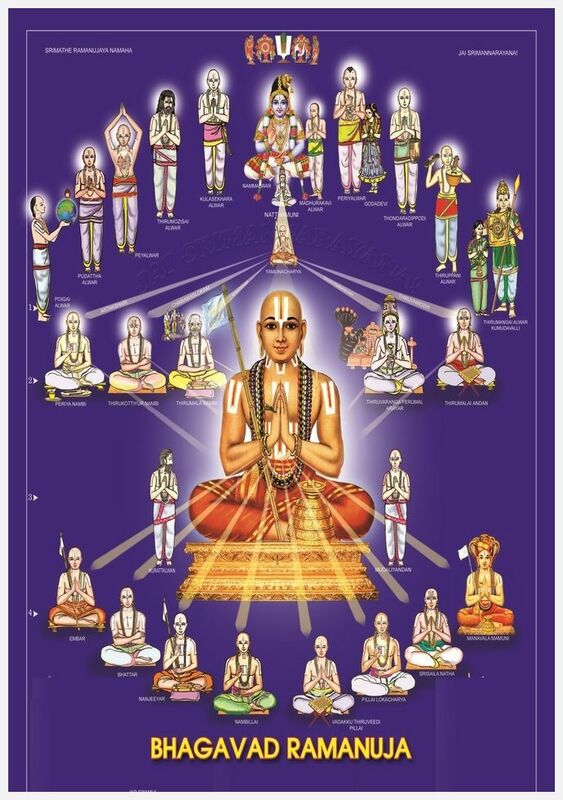 Ramanuja became the second Alavandar and attained special powers more than Alavandar. During this period, in SriRangam, all rituals in the temple were conducted as per the instructions of head priest. The head priest did not like Ramanuja and wanted to eliminate him. So he called Ramanuja to his house one day for having food and planned to kill him by mixing poison. When Ramanuja came a little early before the head priest has arrived, the priest's wife saw Ramanuja's divine face and immediately told the truth and wanted him to go away. Ramanuja also immediately came out of the house without having food. But the priest did not leave Ramanuja. When Ramanuja came to the temple in the evening to get Perumal Thirtham, the priest mixed poison and gave it to him. Instaed of Ramanuja fainting and collapsing, he danced with joy. Next day morning, when the priest passed by the house of Ramanuja, he saw all his disciples singing stotras and chanting slokas. He was surprised and went inside to see Ramanuja. The moment priest saw Ramanuja's divine face straight, he realized his mistake and fell at his feet and prayed to forgive him. Ramnuja's service to promote our Sri Sampradaym grew day by day and he established a system at SriRangam temple which is called as "Koilolugu" to perform the daily rituals and procedures to run the temple. This is followed even today. After this he went to Tirumala and established a system and created a mutt(religious institution) to organize the activities of the Tirumala temple. He had written various books on our Sri Sampradayam. He established the Vishistadvaita philosophy based on the Vedas and alwars' Divya Prabandam. He appointed 74 simharihipathis to spread our sampradayam. He established a temple for SrimaN Narayana in a place called Thirunarayanapuram (called as Melkote) in Karnataka state near Mysore. His works continued and he was taking all efforts to spread our Sri Sampradayam till his last. He lived for 120 years and attained Vaikuntapathi from SriRangam.